Teaching With An Open Heart: You get an A+! Many years ago, I was in a job where the culture wasn't that great. There was a lot of tension and pressure. "Encouragement" came in the form of meetings where you were told how bad the students were failing and that it was pretty much your fault and you had to do better. There was a hardness and a coldness to the message. And....THIS DID NOT WORK FOR ME. I am teacher who is never satisfied. I am always trying to do better by my students. I love learning about how I can relate better to them, what methods I can use to instruct them more effectively, what activities might ignite their fire.... A good teacher is always learning and changing and growing in my opinion. You are never really done. And, here's the thing- I am harder on myself than anybody else will ever be. I challenge myself and criticize myself like nobody's business, I am well aware of the high stakes here. I am dealing with lives, human potential, and futures. And, I know it's serious business. I really get it with my whole heart and mind. I don't want you to think I'm not okay with constructive criticism or being challenged. I'm more than okay with it- I actually kind of like it. But, I want it to be framed in the right way. I want it to be framed with HOPE and INSPIRATION. And, I also want to be acknowledged for the good work I am doing at times. Everyone needs feedback. And, everyone needs validation. Especially in the field of teaching, where there is a loud chorus of critics at times, we all need to be reminded that the work we are doing is important and valuable. When I was in that negative culture many years ago, I decided that I would go on a one-woman crusade of making sure I told others they were awesome when I saw them being awesome. Let me be clear. I am not talking about empty praise or causal compliments. I'm talking about the real deal. Complimenting colleagues in a sincere and genuine way. So, I started saying things to people when I noticed great work. Or sometimes I sent an e-mail. Sometimes I even made sure their supervisors knew how incredible they were. The campaign worked and it still works. I try to keep following these principles. So today I'll write about a few special people who graced my life this teaching year. I think I already thanked them this year at some point and told them they made a difference to me. But, just to make sure, here goes. Since this blog is anonymous, they won't be named, but they know who they are. I have a principal who has made it clear that he cares about the English learners in our building and follows through in his actions and his words. I feel supported and valued and he inspires me to work even harder. You can always spot the teacher-leaders pretty easily in a group. Others listen to them and respect them. It's great when those teachers also happen to be smart, positive, and have a good sense of humor. One such leader helped us see that our schedule needed fixing and then she made sure to follow up and ensure that it was fixed. It might have seemed like a small gesture to her, but to me it was huge. She was willing to go to bat for us over what was the right thing to do, and that's a pretty remarkable thing in my mind. There's a lovely teacher who teaches the other English learners in the building and when we moved to this site two years ago, she was thrilled. Some schools and teachers will look at our center as a drain on resources and with a deficit mind-set. But not her. Nope. She told everyone that our group was the greatest thing since sliced bread and she paved the way for us. She's a fierce advocate for all the English learners in the building and she's sensitive and she's all heart. She tears up or cries easily and I really love that about her, being a fellow easy-crier myself. She's often the first person who reads these posts because she's up as insanely early as I am and she's always generous with her comments and praise. And, a week ago when I was stressed to the gills, we messaged on Facebook for a while in the morning and she helped me get out of my pit. So lovely. We're always on the look-out for more help in our center because the needs are so great. Really, we could have a one-on-one situation and still be busy. Especially during math, where the needs and abilities are the biggest range I have ever seen in one classroom. We have kids from refugees camps who need to learn the numbers in English, then counting, then adding. And, we have kids from some countries who are far more advanced than the U.S. with math and need to take the highest math class in the building once they have enough English to handle it. So, when the principal told me that the Spanish teacher was willing to spend some time with us during math class, I jumped at the offer. She probably told me 50 times that her math wasn't that great, but she handled what she needed to do beautifully. And, what I cared about more than her math skills was the fact that she connected to our students. She loved them; she enjoyed them; she "got" them. So, when she would stride in every day, a small, compact, happy bundle of energy, the students and I were always grateful to see her. So, the instructional coach in the building was enlisted to help with supervision (a.k.a. "let's make sure no one drowns") After she had been doing this for a little while, I asked her how it was going. I mean, I was a little worried- this wasn't exactly in her job description. But, when she responded to me, I knew she had fallen in love with these kids- something that often happens when you spend a little time with them and really see them for who they are. She enjoyed them, got a kick out of them. And, they loved her. Kids are expert at spotting realness. They know right away if you like them. And, they knew she was on their side. For the rest of the year, one girl would always make a bee line for her if she saw her in the hallway and give her a big hug. She spent more time with us- on field trips and got to know the kids better. On our last trip, one of our students, sat with her on the bus and told her some hard truths about her life and journey as a refugee. They don't tell their story to just anyone. I know that. She had earned the trust and affection. Finally, I could never write a post about colleagues who are special to me without writing about my main colleague. I have told her that if she is ever thinking about leaving this job, to please give me advance notice, because I will be right out the door behind her. I could probably write a book about all of her good and amazing qualities, but this post is already long so I'll try to be succinct. She has one of the biggest hearts I've ever encountered and she will never give up on a kid, no matter how much they challenge her. I watch her teach sometimes or interact with kids and I am just blown always by her strengths and talents. She lifts me up when I need lifting up and she makes me laugh when I need a laugh I have cried to her more time than I can count. I like to think we take turns being strong and needing help so that it all balances out. During the school year, we spend more time with each other than with our families, so thank God we enjoy being together. Often at the end of the day, we sit at her computer and answer e-mails together. Sometimes we vent. Sometimes we say snarky, inappropriate things we want to write and laugh hysterically. And, then we gather ourselves together, and write a professional response. You know how you're supposed to give specific praise to kids and tell them what they're doing well? Not just say, "Good job, Johnny." Well, that's great. But, when kids are first learning English, you have to sometimes revert to "Good job." So they understand you. She likes to tell kids "That's an A+." They adore this. So, to all the people I wrote about here today: YOU GET AN A+!!!!! Now, do one thing for me, and pass it on. Tell someone this week how much they mean to you and how much they helped you this year. I promise, you will feel amazing and they will feel amazing It's a win-win! You have nothing to lose and everything to gain. Go ahead. 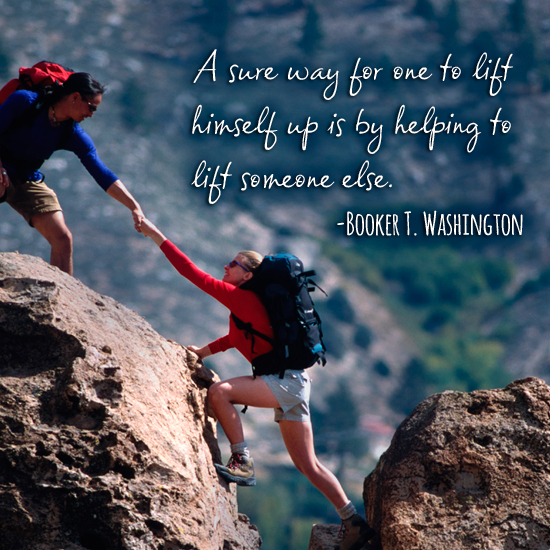 Lift each other up.